World of two halves! Map shows most of Northern Hemisphere is covered in snow and ice. Most of the Northern Hemisphere was covered in snow and ice a few weeks ago? (The image dates from late January/early February—I couldn’t find the exact date.) Really? At first glance it’s a plausible claim, but there’s a problem. 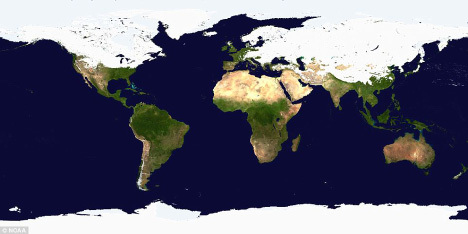 The map is in a cylindrical equirectangular projection, which distorts relative areas—regions north and south of the equator appear larger on the map than they are in reality. The higher the latitude, the larger the exaggeration. As a result, a much higher percentage of the Earth’s surface appears to be covered in snow or ice than really is. For maps of measured quantities on the Earth’s surface (like snow, temperature, rainfall, or vegetation) it’s important to choose a projection carefully, to minimize misunderstandings of the underlying data. It’s far too easy for a map to exaggerate one area at the expense of another. It’s also important to keep projections consistent when displaying a time series, or comparing datasets to one another. Despite the major flaw of not being equal area, cylindrical equirectangular (which goes by many other names) is very useful: it’s the standard projection for importing into a 3D program and wrapping around a sphere, and it’s easy to define the corner points and scale for import into software to transform to other map projections. I did all the reprojections with the excellent tool G.Projector, which I’ve written about before. 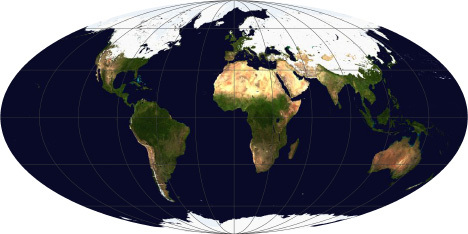 For more information about map projections, see the USGS page Map Projections, the National Atlas’ Map Projections: From Spherical Earth to Flat Map, and the Wolfram Mathworld Map Projection site. For an in-depth discussion, read Map Projections—A Working Manual, (PDF) also from the USGS. This entry was posted on Thursday, February 24th, 2011 at 7:53 pm and is filed under cartography. You can follow any responses to this entry through the RSS 2.0 feed. Both comments and pings are currently closed. Another exceptionally informative and compelling post. Thank you! 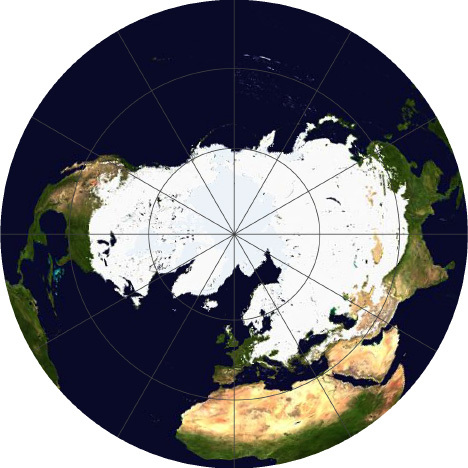 The area above 60 degrees north is always shown on maps that are distorted as you show and when the Arctic is shown in a map drawn with the pole at the center the size of the Arctic Ocean is seen as a much smaller body of water. Good job. Depending on the format of the maps, sure. Unfortunately, I don’t have any maps of the last glacial maximum at the moment. S’il y a extension de la glace pourquoi parle -t-on du réchauffement climatique??!!!!!!!! Thanks for this most important point in geography. We were having this very discussion and this was an excellent example of how a little “mis” information can go along way to mislead. I appreciate your information.